It was an honor to meet Dr. Snyderman at the American Medical Association's National Advocacy Conference. This was taken up in Washington DC on Tuesday evening, March 2, 2010, at the AMA National Advocacy Conference. 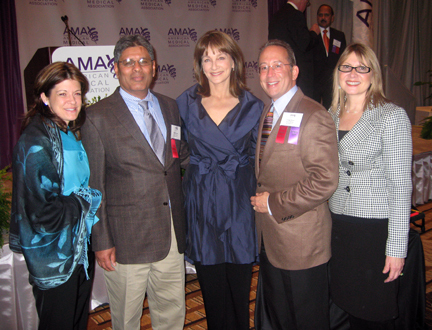 Kelli Sultan; Shahid Sultan, M.D., President-Elect, Lee County Medical Society; Nancy Synderman, M.D., Chief Medical Editor, NBC News; Craig R. Sweet, M.D., President, Lee County Medical Society; and Vicki E. Sweet, R.N. This page took 0.636 seconds of computer labor to produce.